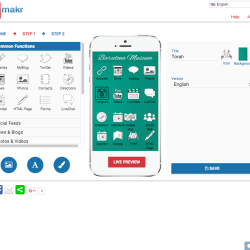 AppMakr Review - How Does the App Maker Compare? AppMakr is considered one of the biggest players in the app-builder market, this is mostly due to the fact that their app-publisher base was combined with that of Infinite Monkeys’ once the latter took over the company in 2013. With the two app makers combined, they account for over 2,000,000 apps published around the world. 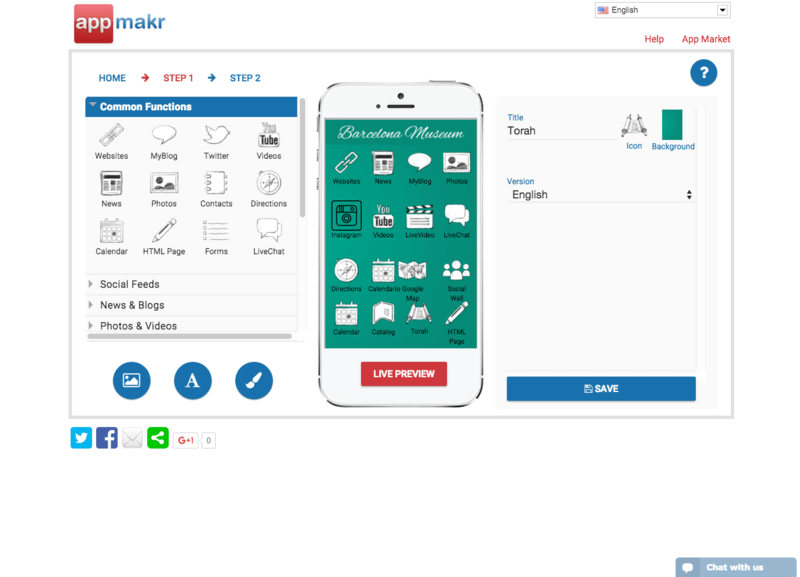 AppMakr’s builder was first introduced back in 2010, when the app-making industry was in its infancy. Several other builders also popped up around the same time, yet many of AppMakr’s competitors fell by the wayside over the next few years. This, too, seemed to be the fate for AppMakr, with the company releasing statements about its deprecation in 2013. Shortly after this, though, Infinite Monkeys came to the rescue and gave AppMakr a new lease of life. 2013 was also a turning point in the industry, with new builders launching, and old builders reinventing themselves. Strangely, though, it appears that Infinite Monkeys were satisfied to hold the market-share of apps published without considering updating an aging platform. Now in 2015, this appears to be to their detriment. As someone relatively new to the app-building world, trying to use this platform after trialling several others in the market was a trying and unfulfilling experience. 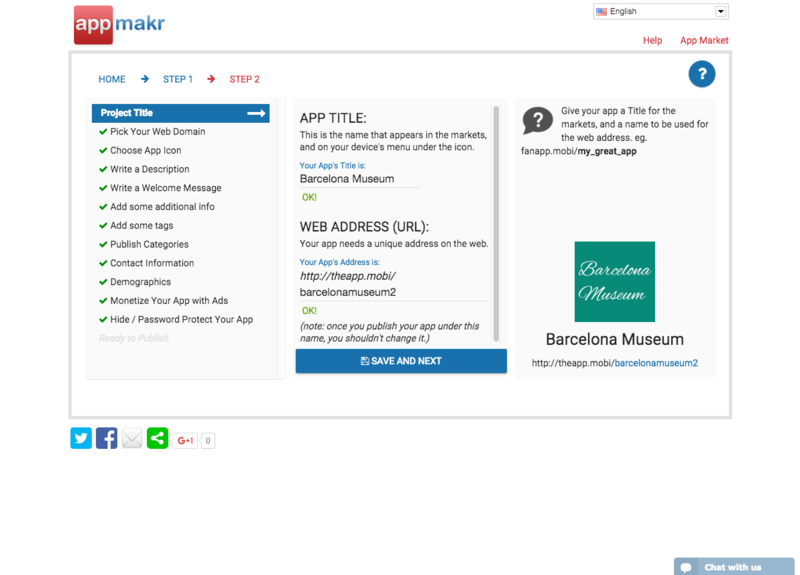 These days many platforms have progressed in leaps and bounds, yet AppMakr seems to be stuck in a time warp. Native Android only (and only within the AppMakr market) with AppMakr branding. Unlimited users and updates. Price is per year. Android app and Web App submittable to the app stores. Your own branding. As above, yet with reseller options added. Note: prices are for yearly subscriptions. 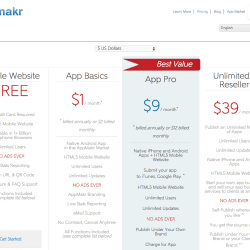 AppMakr’s prices are really hard to beat, with a native android application available for a miniscule $1 per month plan. Also, for all the bells and whistles, not to mention source code and unlimited apps, you can get this for $39 per month, cheaper than most other app makers’ mid-tier plans. You will find support for 15 languages on AppMakr’s builder, including a good selection of several non-Latin based languages such as Arabic, Hindi, Sinhala, Tamil and Thai. This opens up the platform to some international markets that are not often catered to by the app-making community. 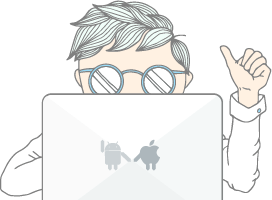 AppMakr have their own market, which means you can get your app published even faster, and in native Android, even on the $1 per month plan. The editor itself is both slow and overly-sensitive at the same time. Each time you move an icon, the editor loads, and due to this you often misplace the icon on the drag-and-drop grid structure of the editor; this creates a vicious cycle. I found that one of the features wouldn’t load at all, and led the editor to freeze for several minutes each time I tried to use it. This is something that doesn’t seem to happen often, if at all, which can be detrimental to your app once new OS’s arrive. While the signup process is easy, once you’re in the editor it becomes a little messy. There is a clearly defined feature sections though, and once you figure out the drag and drop system it’s mostly easy to add features, just fiddly. The editor is extremely slow in comparison to other app makers, with loading occurring each time you click on a feature. 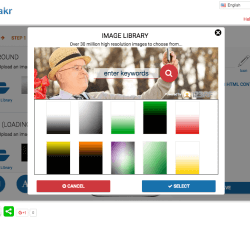 AppMakr doesn’t have templates as such, just a few free background options that are made up of block colours and a couple of stock images. Or you can pay $1.99 for a stock image that looks like it came bundled with Microsoft Office ‘95. You can only change the icons if you have your own designed set, otherwise you’re stuck with their slightly mismatched, sketchbook-style icons. There are also no menu template options other than placing icons on a home screen. If you are tech savvy, you can access the source code on the highest plan and adapt it, but it may not be worth your time. The website and app interface are both available in 15 languages, yet some web pages didn’t appear to be fully translated when switching from English. 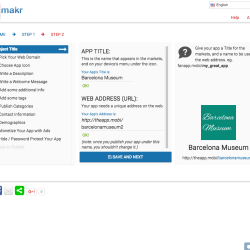 AppMakr says you can build an HTML5/iOS Mobile website, which is misleading. They are talking about web apps, but it looks like they can’t publish iOS on the App Store following Apple’s new guidelines. This is a weak yes, as there is a feature that allows you to see where other community members on the app are posting from, and also some food service integration options. A ‘Directions’ feature is also available, yet it didn’t work correctly during my app creation and I was unable to test its functionality. You can create a catalogue of items, although it appears you may need to link the user to a web-store if they want to buy anything, as there is no ‘Checkout’ feature available. You can also add an eBay section, which is just a mobile version of your store. AppMakr do have a couple of unique features here with donation functionality for either a church or a not-for-profit, and also a ‘Classifieds’ section. There are several versions of RSS feed features available in the form of ‘News’, ‘Blog’ and ‘Live Video’ sections. All of the basics are here: Facebook, Twitter, YouTube, Instagram. Along with a few user tools such as live chat and community walls. This feature is not available at present. There is no downloadable viewer available for your mobile device, yet you can scan a QR code which gives you access to the online web version of your app to preview. 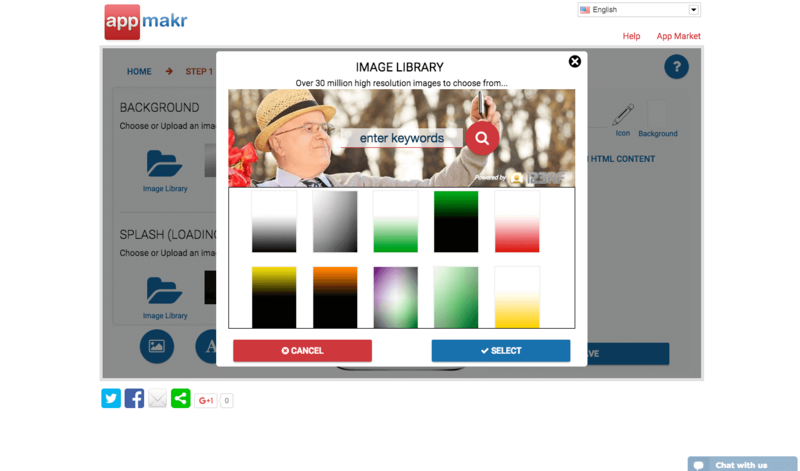 AppMakr have an inbuilt ‘Stats Dashboard’ which seems to be the only option. 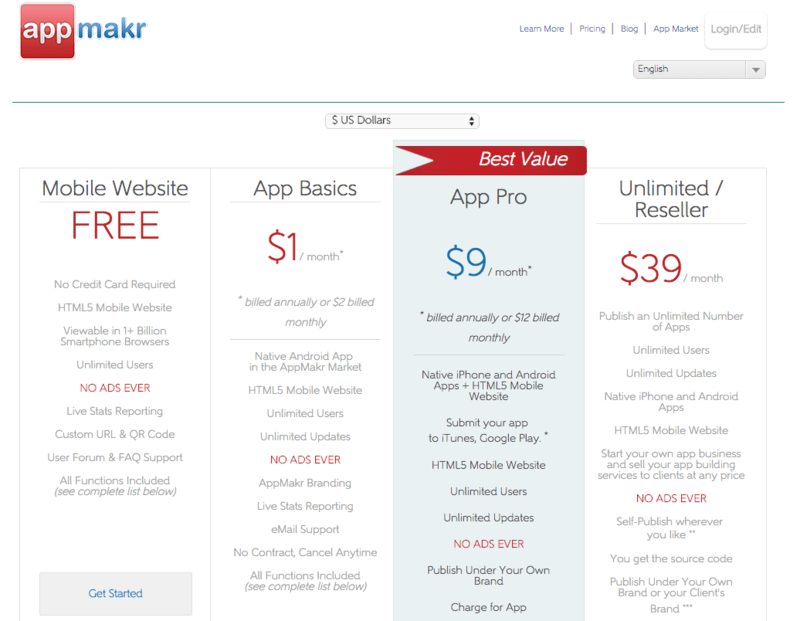 AppMakr’s top pricing tier is also their ‘reseller’ tier. It sounds like a steal at 34 €, although it’s unclear if you get your own backend that can be customised with your company logos and accessed by your own clients. While there seems to be an ‘Official FAQ’ page, this functions more like an unattended forum with questions being asked by the public that are indistinguishable from the AppMakr-created content. Their email response was relatively quick, yet only partly-answered my question. They did seem happy to help further if needed though. One thing to note: AppMakr do have a very active social media presence and a blog that is updated very regularly. This app maker is more frustrating than fun to use, due to its limited capabilities and inability to keep up with the new technologies available to DIY app makers. Unfortunately using this app builder feels like stumbling upon one of the first web pages, before technology advanced and people understood the power of the internet. It’s quite surprising that Infinite Monkeys took over without updating any of the functionality and, unless this occurs, it will be very difficult for AppMakr to remain relevant within the app-builder market. Coming at this from a purely technical perspective, AppMakr does not have the features or the functionality (and none of the fun) of the other builders out there. The overall design, as well as the individual elements, are outdated and largely inflexible. Because of this it’s difficult to create a nice-looking app, and the bottom line is: if your app looks bad, or is difficult to use, people will not download it. Whilst they may have had the app-publishing market share in the past, if there isn’t a major platform overhaul it won’t be long before a competitor takes the crown. AppMakr’s disorganised support system, most obvious through it’s poorly designed FAQ and Knowledge Base sections, seems to mirror a disinterest in their product as a whole. This is strangely at odds, though, with their active social media presence. 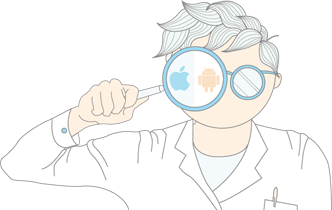 Yes, the builder is extremely cheap, offers a wide array of language support and, therefore, may be useful for app-makers in more developing parts of the world, but there are many more options available in 2015 that you should spend your time and money on. Yes. They offer a 30-day money back guarantee and there are no cancellation fees. Can I easily upgrade, or downgrade, my plan? If you want to upgrade your plan, you just need to republish your app on the plan of your choice. If you want to downgrade, you need to cancel your current subscription, and subscribe again to the new one. It’s worth noting that the lower plan does not support the Apple store, so if you downgrade to this one, then your app will be taken out of the store.